Is your house dirty? 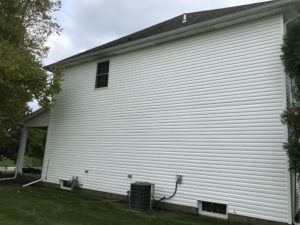 After several years vinyl siding starts to lose its semi glossy appearance, and with that its ability to resist mold, mildew and other contaminates from clinging on to it. Areas that are most affected are the ones that don't get the morning sun to dry the dew that has accumulated on them. With this prolonged exposer to moisture it becomes the home of mold, mildew, moss and other living organisms that thrive in that environment. Our house washing process uses LOW PRESSURE and high quality detergents that kill, break down and remove the living organisms, dirt and grime that are attached to the house. This SOFT WASHING process is the SAFEST and MOST EFFICIENT way to clean your home. 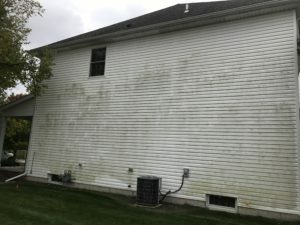 This is a DAMAGE FREE process that wont hurt your house, plants or grass. Restoring the beauty of your home is easy. Contact us today!